As is my wont, when I go to Lüke I frequently drink an Ojen Frappé. Ojen (OH-hen) is a sweet anisette made in a small village in Spain that, for some reason, New Orleans fell in love with ages ago. 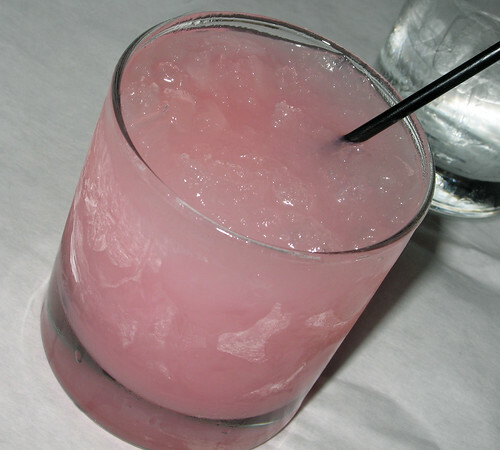 Ojen cocktails appear in Stanley Clisby Arthur’s famous 1937 tome Famous New Orleans Drinks and How to Mix ‘Em, appeared at many famous New Orleans restaurants, and an icy Ojen Frappé was the traditional toast for Rex, King of Carnival, every Mardi Gras. There’s just one little problem. Ojen isn’t made anymore. Lüke bought a big chunk of the remaining stock so that they could offer the cocktail on their regular menu, and until they ran out it was one of the last bars in the world where you could get this drink. If you’ve got any Ojen left, this is a great way to drink it. If not, you can approximate the flavor by using Anis del Mono Dulce from the Vicente Bosch distillery in Catalonia (the sweet variety, not the dry “Seco” variety), or Marie Brizard Anisette. According to a comment in the above nola.com link, Lüke are now making this drink with Obsello absinthe, making it their version of an Absinthe Frappé to which I imagine they’ll have to add some simple syrup. Use an ounce to ounce-and-a-half of Obsello absinthe and a tablespoon of simple syrup instead of the Ojen or anisette. 2 ounces Ojen (substitute Anis del Mono Dulce or Marie Brizard anisette). Pack an Old Fashioned glass with crushed ice. Add ojen, bitters and seltzer, and stir until the glass is frosty. Choucroute garni, or “dressed sauerkraut,” is a classic Alsatian dish of sauerkraut and onions cooked in pork stock, white wine (usually Riesling or Gewürzraminer) and spices (usually juniper berries, cloves, black pepper and more), along with pork products of various kinds. 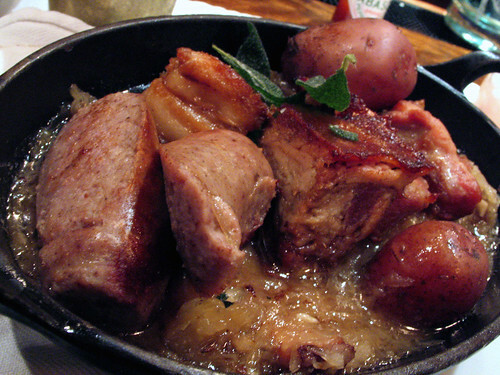 At Lüke the choucroute comes with housemade spicy pork sausage, Berkshire pork belly and pig knuckles. Hey, Chuck — I was never lucky enough to get a taste of actual Ojen when I lived in New Orleans for college (or at any time since then), and now I understand it’s gone forever except for stashes like yours. I have a bottle of MB Anisette and it’s ok I guess, but I’m looking for something closer to real Spanish Ojen. Today I picked up two interesting-looking bottles of Anis Liqueur from Spain called “Chinchon”, one labeled “Dulce” (sweet) and bottled at 70 proof, the other “Seco” (dry) at 86 proof. Have you ever heard of this stuff and/or tried it? From your description above it sounds like the “Dulce” would be the one to try in a Frappe preparation, but isn’t the proof of actual Ojen closer to the 86-proof strength of the “Seco”? Hey Mike — Ojen is 84 proof, so it’s close to the Seco. Ojen is also fairly sweet, despite its proof, and I don’t know how dry their “seco” is. I haven’t seen the Chinchón product here, but I do see Anis del Mono fairly often. I’ve been tempted to get both their dulce and seco bottlings and try them side-by-side with Ojen. I’d bet both of them would make a terrific “Ojen” Frappé — depending on how dry the seco is you could add a couple or so barspoons of simple; I’ll bet the dulce won’t need it at all. Yep, you’re right — both of the Chinchon products are great in this application. I’ve made several over the past few evenings, and my favorite is to use a mix of about 1.5 oz of the Seco and .5 oz of the Dulce. Both are a lot more interesting than MB Anisette, which now tastes to me like anise-flavored simple syrup. Who knows what might come of this, especially since the central protagonist is now apparently deceased, but perhaps some reason to hope for a return of Ojen. Hey Mike! Thanks a million for that article. Very interesting … and very sad about our central protagonist. Here’s hoping the stuff comes back — it’d certainly make New Orleans happy. In the meantime I’ve still got about 1-3/4 bottles of the old stuff left.